Here for spreading far and wide is a graphical reminder of the important distinction between correlation and causation. 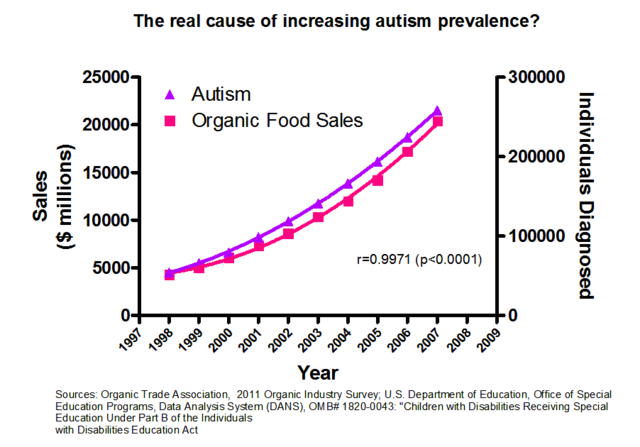 Redditor Jasonp55 writes that he was practicing Graph Pad when he produced the chart above and discovered the "real" cause of autism: organic food. His tongue is obviously planted firmly in his cheek here, but the chart is nonetheless a simple and compelling example of how susceptible we can be to logical fallacies, cognitive biases, and extracting what we believe to be meaningful information from insignificant or coincidental data. As Cory Doctorow notes over at Boing Boing, "this a potentially useful chart for discussing this issue with friends who won't vaccinate themselves and their kids."